The School Energy Coalition (SEC) was formed in 2011 to advocate on behalf of energy and water efficiency and management in California’s K-14 schools. We are here to ensure that educational facilities are included in state and federal legislation and regulatory action that provides funding and/or technical assistance in these areas. SEC was instrumental in moving forward the Proposition 39 energy program and its focus on K-14 schools. We continue to participate in this vital program’s implementation by providing the school perspective on what is working and what is not with involved state agencies. This has resulted in changes that make the program work better for Local Education Agencies (LEA) who are seeking funding approval for school energy projects. We are actively involved in discussions with state agencies such as the California Energy Commission (CEC), Department of Education (CDE), Division of the State Architect (DSA), State Water Resources Control Board and the Air Resources Board (ARB) on issues of importance as schools meet the challenges of statewide water conservation and seek to lower greenhouse gases that assist meeting statewide climate goals. To that end, we believe schools should be a priority for project funding to address global climate change through campus projects that reduce energy and water consumption and educate students about lowering our reliance on fossil fuels. We invite you to consider joining SEC as we provide valuable input to key stakeholders. Membership provides superior access and opportunities for input on state actions related to energy and water issues involving school construction. We provide networking and educational forums for schools and others including key policy-makers, to share up-to-date information about how to successfully move school energy and water projects forward. Click here if you wish to view the membership application. 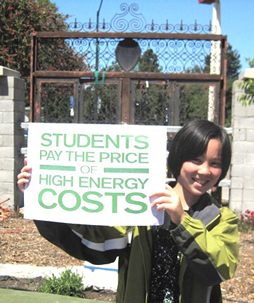 The School Energy Coalition is dedicated to finding funding for school projects that will reduce and better manage energy and water usage, save money and produce clean renewable power for our students and communities throughout California. We fight for dedicated school energy and water programs that will provide pathways to real dollars for school projects, along with technical assistance and training for schools that will ensure that these projects will provide the savings promised and maximum system efficiency. Send us your Webinar proposals or requests.